The 2011 annual ATBL Chairman’s Council trip and British Library tour was held at the end of March for participants to attend the Douglas Bryant Lecture (named for the first Executive Director of The American Trust for The British Library.) This popular lecture series is held under the auspices of the Eccles Centre for American Studies and arranged by its Director Philip John Davies. Philip Bobbitt, Herbert Wechsler Professor of Jurisprudence and Director of the Center for National Security at Columbia University, gave the Sixteenth Annual Bryant Lecture on “Why Men Hate to Talk about Relationships: The US, the UK, and the Atlantic Alliance.” Following a stimulating and challenging lecture, Chairman’s Council guests enjoyed an intimate dinner at which Professor Bobbitt answered questions. Earlier that day, The British Library mounted a splendid information-packed day for our group. We met the new Chairman of The British Library, Baroness Tessa Blackstone, who outlined her vision for the Library. She has generously agreed to give the Breslauer VI lecture in New York City on October 17. Also Dame Lynne Brindley, CEO of the Library, gave us the 2010 highlights and thanked the group for its continued support, especially in light of the government’s cuts in the Library’s budget. One of the projects ATBL is supporting is development of an online gallery marking the 150thAnniversary of the American Civil War. Nicolas Bell, Curator of Music Manuscripts, then showed us a selection of Handel’s autograph scores (in preparation for our visit the next day to Handel House in London where George Frideric Handel lived, wrote and rehearsed for 36 years). 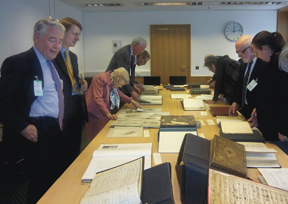 He also showed us how the recent loan of Gilbert & Sullivan material from the ATBL strengthened the BL’s music collection. We also saw an original score Mozart wrote and My Ladye Nevells Book of Virginal Music acquired in part through support from the ATBL. At lunch the ATBL guests were joined by Kathleen Doyle, Curator of Illuminated Manuscripts, and the ATBL-sponsored intern Sarah Biggs. Roger Walshe, head of Public Engagement & Learning, led us on an afternoon tour of an exhibit that the ATBL helped sponsor, entitled Evolving English: One Language, Many Voices. This was the first exhibition ever exploring the English language in all its national and international diversity. Iconic collection items were set alongside engaging everyday texts and sound recordings to show the many social, cultural and historical strands from which the language is woven. Valuable Treasures such as the only surviving manuscript of Beowulf, Caxton’s printing of the Canterbury Tales and Shakespeare quartos, and recorded speeches by Pankhurst, Churchill and Gandhi were exhibited together with handwritten letters, posters, lists of slang, the first dictionaries, adverts and dialect and music recordings from around the world. was a fascinating exhibit with audio, visual, interactive games, and recording booths dramatically illustrating this once in a lifetime opportunity to see and hear the English language in all its myriad forms, from 5th century runes to 21st century youth-speak. A number of Chairman’s Council participants offered hospitality throughout the week. Sunday evening Lisa von Clemm opened her home and her lovely garden for cocktails. Monday evening, after a tour of Lambeth Palace Library and Conservation Tower by Dr. Giles Mandelbrote, Librarian and former British Library curator; the Garden Museum; and Westminster Abbey and Library by Dr. Tony Trowles, head of the Abbey Collection and Librarian, Kate Ashton and Brian Young held a wine and cheese reception to end this full day. 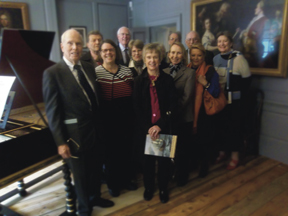 James Sitrick facilitated a tour of Handel House on Wednesday morning. Participants then walked around the corner to Sotheby’s, where David Redden had arranged for a magnificent lunch attended by various Sotheby experts, and a preview of a sale of signed first edition American authors. 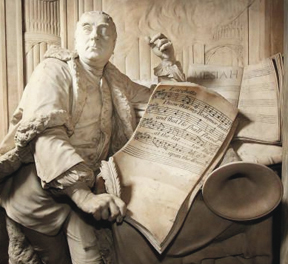 Some guests attended a concert of the Susanna oratorio at the Handel House, previewed the Sotheby sale of Islamic Art, and took a tour of St. Pancras Renaissance Hotel and Station. Sir John Betjeman, (1906 – 1984) was the Poet Laureate who led the effort to prevent demolition of St. Pancras Station, neighbor of the British Library, the red brick exterior of which was intended to harmonize with St. Pancras.